It shouldn't be a surprise that 2014 Press Pass Total Memorabilia Racing includes plenty of relics. 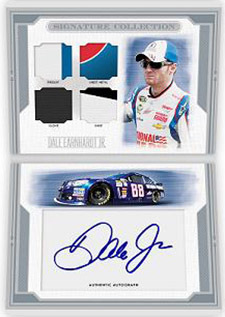 In fact, every pack of the high-end product comes with either a memorabilia card or an autograph. Those who collect Press Pass NASCAR products know the company is big on using lots of different pieces and parts of race gear. Total Memorabilia proves it once again. Clear Cuts have a piece of a race-used windshield embedded in them. Dirt Track Treads have pieces of truck tires used at the first dirt track race at Eldora Speedway. 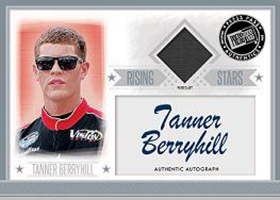 Other memorabilia-focused inserts include new Champion's Collection cards, Burning Rubber Chase Edition and Rising Stars, which include both memorabilia and signatures from top young racers. The product also includes autographed memorabilia book cards. 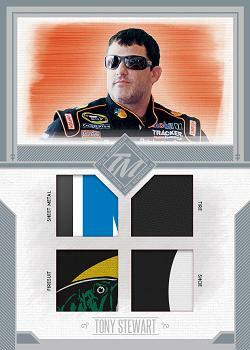 The 2014 Press Pass Total Memorabilia Racing base set has a total of 50 cards. With five per pack, it will take a minimum of two boxes to finish it. 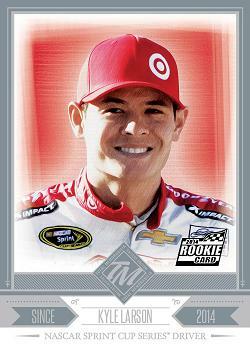 The checklist includes rookie cards of Kyle Larson, Justin Allgaier and Austin Dillon. Base cards have numbered parallels, which land one per pack. 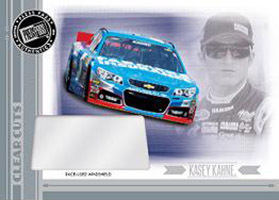 Download the 2014 Press Pass Total Memorabilia Racing checklist.